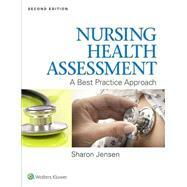 Develop the assessment knowledge and skills you need for clinical practice with Nursing Health Assessment: A Best Practice Approach, 2e. This proven book emphasizes health promotion, risk factor reduction, evidence-based thinking, and diagnostic reasoning. You will learn strategies for adapting questions and techniques when communication is challenging, the patient's responses are unexpected, or the patient's condition changes over time. Unique features help you apply and analyze concepts and prepare you for effective practice in any health care setting. Normal and abnormal findings are presented in side-by-side columns and comprehensive examinations are included for each topic. Additional features, online resources, and book-related media build on the in-text cases to reinforce correct elements of subjective and objective data collection and variations necessary for different problems, age groups, and cultures. Learning Objectives highlight the key information you need to master by the time you have completed the chapter. Hundreds of full-color photos and illustrations help you retain important concepts. Clinical Significance features highlight content critically related to clinical application. Safety Alert boxes present important areas of concern or results that require immediate intervention or adjustments. A Threaded Case Study in every chapter demonstrates real-world application through a wide range of innovative features. Therapeutic Dialogue displays provide examples of “less effective” and “more effective” communication to help you hone the communication skills you will use with patients when gathering assessment data. SBARFramework (Situation, Background, Analysis or Assessment, and Recommendations) helps you organize details when coordinating referrals or other patient advocacy needs. Documenting Abnormal Findings: The results from the case are charted using the four techniques of physical assessment (Inspection, Palpation, Percussion, and Auscultation). Analyzing Findings: A sample SOAP note (Subjective Data, Objective Data, Analysis, and Plan) shows you how to analyze assessment information and plan care based upon the assessment. Reflection and Critical Thinking: One priority problem is identified and a plan of care is developed based upon the assessment. Structure and Function Overview sections review anatomy and physiology and provide additional content on variations related to lifespan and culture. Acute Assessment sections summarize emergency signs and symptoms to look for and immediate assessments and interventions to implement. Subjective Data Collection sections focus on areas for health promotion, risk assessment, and health-related patient teaching. and provide focused assessments for common symptoms. Objective Data Collection sections cover equipment, preparation, techniques, normal findings, abnormal findings, lifespan and cultural adaptations, and sample documentation. Evidence-based Critical Thinking sections explain how nurses analyze findings and take the next steps to address patients’ concerns. Sections include Common Laboratory and Diagnostic Testing, Nursing Diagnosis/Outcomes/ Interventions, Organizing and Prioritizing, Collaboration with Other Health Care Professionals, and Applying Your Knowledge. Tables of Abnormal Findings cluster common abnormalities related to the specific assessment with compare-and-contrast information on key data points. NCLEX Review sections include 10 NCLEX-style test questions per chapter to help you master concepts and prepare for the boards.